This morning we took our walk while it was still cool and sunny outside, but the humidity is already up there with the impending rain expected later this afternoon. It looks like we won't be grilling for dinner this evening. When I did my Costco run yesterday, I was disappointed to see that they still didn't have any wild Copper River salmon in. I know this is the season for it but I haven't seen it anywhere. I'm wondering if it simply isn't making it here to our area or if there are problems with this year's catch. I was really hoping to find it for last night's dinner. If anyone in the Atlanta area has seen any, please let me know where! One of the things I really love about this time of year is the abundance of fresh produce. 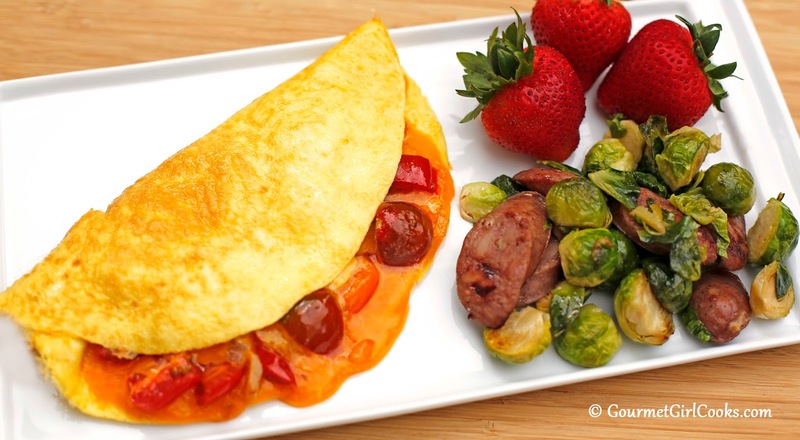 After we came back in from our walk, I made myself an omelet filled with sauteed multi-colored mini tomatoes, vidalia onions and sharp cheddar and served it with a quick brussels sprouts and sausage saute along with fresh strawberries. It was a rainbow of colors on my plate. I snapped a quick photo below. If any fellow Atlantans have spotted Copper River salmon anywhere...please share where. Enjoy! We haven't seen Copper River Red yet, either. We've been looking for it, since it's the "season," and wondering what's up with that!